LIMSA — We'll Help You Make the Right Move. We’re Long Island’s premier group of moving and storage professionals, dedicated to providing you with honest, reliable service. WE’LL HELP YOU FIND THE RIGHT LONG ISLAND MOVERS. Are you looking for Long Island Movers? LIMSA (Long Island Moving and Storage Association) is an association of licensed professional Long Island movers who adhere to LIMSA’s strict Code of Ethics which promises you honest treatment at fair prices. A recent study shows that LIMSA members made more than 51,000 moves a year. According to the N.Y. State Department of Transportation, only nine minor complaints were filed related to those moves. All were resolved to the customers’ satisfaction. The best way to get an honest estimate from a Long Island Moving company is to contact and compare no more than three licensed and professional movers who serve your area, not operators thousands of miles away trying to look like they are your neighbors. The easiest way to do this is to click the “LIMSA Members” link above and call or check the web site of three LIMSA movers in or near your community. LIMSA members serve all of Long Island, as well as Queens and Brooklyn. We created this Web site to help you find Long Island movers you can trust, warn you about Internet sites and phone directories that use false advertising, and to advise you how to avoid mistakes that can make your move a very stressful experience. The Long Island Moving and Storage Association was the first moving industry association to create a consumer information web site in early 1996. This site, a Golden Web Award Winner, is dedicated to helping you make the right long distance or local move. If you ever have a legitimate complaint about one of our members, our Grievance Committee will immediately address it. Select links above or at the right to get helpful tips on moving and to learn what questions you should ask your local Long Island moving company. If you read nothing else here, make sure you see Why You Should Use a LIMSA Member to Move Your Valued Possessions. 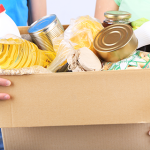 You probably will throw out lots of “stuff” when you move, including non-perishable food. Ask your local Long Island mover if he can deliver that food to a food bank for a family in need. Learn More > Click Here. LIMSA members are Long Island movers who are dedicated to making your move a success. Don't move firewood! Invasive bugs hide there, and you don't want to make a bad problem worse. Why Should You Hire Only Licensed Movers? States have regulatory agencies that qualify and license members of certain professions to protect the public. Doctors, dentists, lawyers and, yes, even movers are among those who must be licensed to operate a practice or business serving consumers. Professional licensed movers spend time learning their profession. They follow state and Federal rules regulating their business, train their workers and invest thousands of dollars establishing a real place of business, paying experienced help and operating expensive trucks and other equipment. Long Island Moving & Storage Association Long Island Moving & Storage Association updated their cover photo. Make an educated choice – learn about different types of moving insurance and discover which plans and policies are right for you. Storage containers are a popular option for those looking for temporary storage or moving solutions; our experts weigh in on the benefits. Knowledge is power — here are the latest New York State Department of Transportation fuel surcharge rates that you can expect when moving.